Video with no talking followed by a video of nothing but talking. I need to get better – I totally underestimate the time it takes to get something done. I really like the Curly Maple and Walnut box Jay. I wondered though, on your bandsaw, do the roller bearings on your upper guide block make much noise. 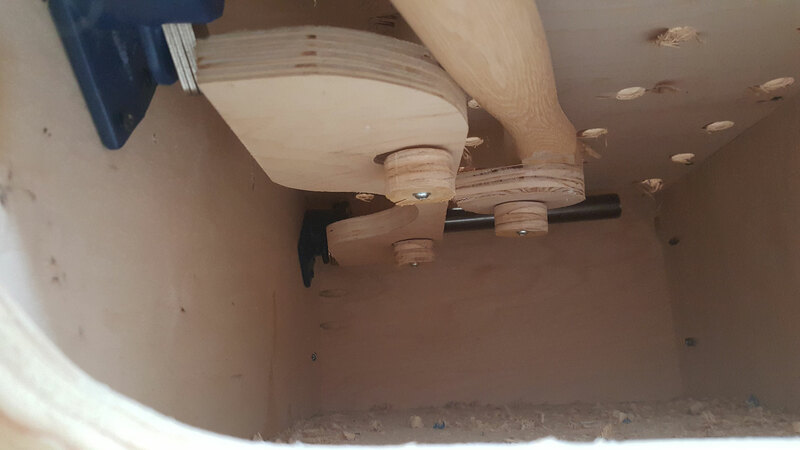 Matthias Wandel tried bearings and went back to hardwood guide blocks for less noise. Do you have anything to say about that? Erik Lancaster – I have already made many of your plans. But the one i use the most is my pipe clamp vise. I used your design completly. 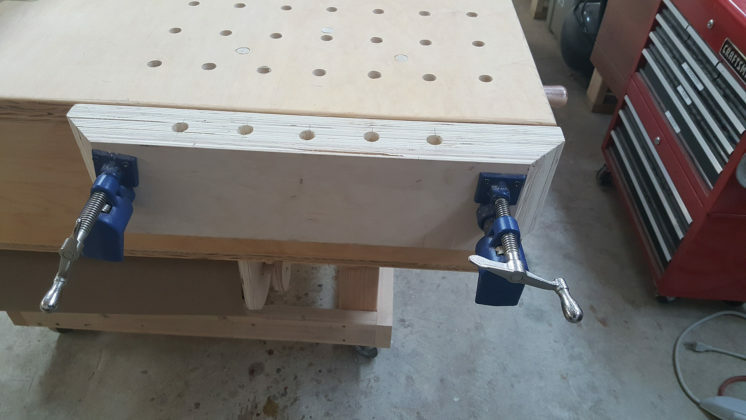 But i wanted to open the clamps to get more than the few inches. The problem was reaching the second clamp in the back. So i made a plate to push both release tabs at the same time. 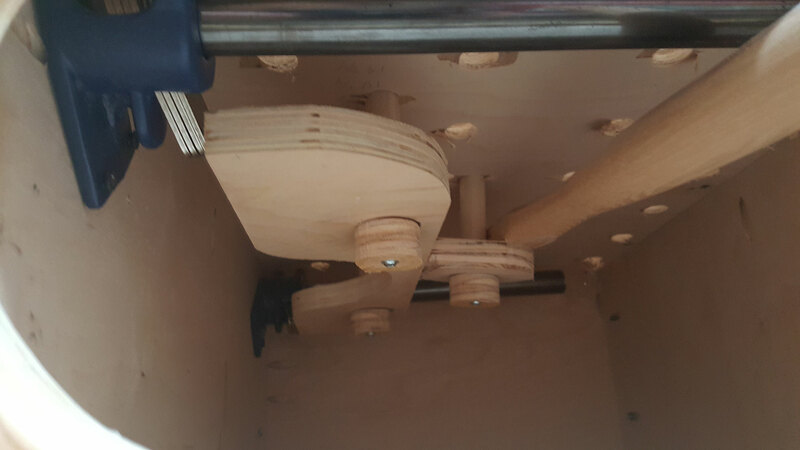 And to put pressure on the plate i cut a cam and mounted everthing on 3 dowel rods. 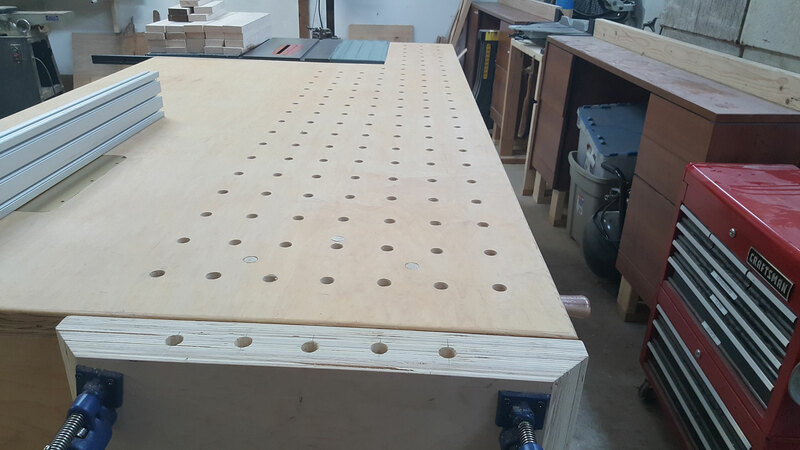 The dowel rods are in 3 additional dog holes in the table top. On the cam i mounted a hammer handle to easily pull the cam. On time: I found making (and writing down) my estimates, and ‘actual’ times, allowed me to come up with my ‘time error factor’. If most projects take 3x ‘gut estimate’ to give ‘new estimate’. It sometimes works, and is sometime off, but is not as far off as my ‘old estimate’ method was. You mentioned your hearing protection; I’ve been utilizing my Peltor headset that I normally wear at the shooting range, but it looks like your headset has a microphone built-in? Wife tells me I always take longer than my estimate. So now I take my gut estimate and double if small project (say a box or picture frame) to triple or more on larger project. Honestly, I still end up under estimating time but I am closer. I’ve used lacquer for years. Spent 20 years in an auto plant, part of which was in the paint shop. Yes, the odors are really obnoxious. I’ve found that name brand water based urethanes give a good finish. I used one on a porch glider that sits on the porch full time, year round. Weather here is much like yours and the finish is holding up very well, still has good gloss after several years of weather. In the can, it looks like watered down milk, dries clear with a high gloss, semi gloss or satin, depending on which one you select..
Hello Jay . I was looking for plans for a sleigh bed . ANY suggestions ? 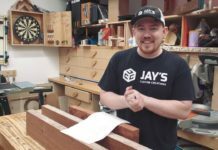 Jay – Regarding the differences in your last two videos ….. my preference is always for instructional content and hopefully without annoying music. It seems that many YouTubers these days seem to want to be music producers rather that content producers. Those videos become annoying very fast. I’m lad you haven’t fallen into that abyss. Thanks for all the great project ideas and instruction! 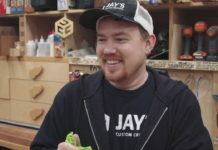 Nice job again Jay. I spray mostly all water base lacquers. Mostly urathanes. Green light coating orM L campell make good products. I use flat. Greenlight coatings can be brushed or sprayed. Nice small family owned company up north in Duluth,MN. Love the boxes, especially the walnut trim on the Maple. I installed Carter bearing guides on my Jet when I bought it ten-years ago. Adjusted properly top and bottom they are no louder than the sound of the blade cutting. They do require fine-tuning with blade changes. Just my experience. Any chance your bearings are running dry. Maybe a little oil would help? I have heard you say you want to make a stand alone router lift workstation… Having a hard time figuring where to place it not in the way… Why not incorporate it into your Paulk table somehow? I thought about that as well but I reeeeeeeeeally like my assembly table to be free of obstruction from tools.